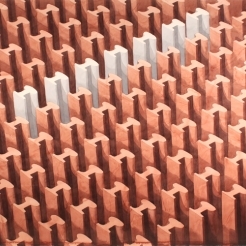 John Berggruen Gallery is pleased to present an exhibition featuring work by Los Carpinteros, James Casebere, Iran do Espírito Santo, and Callum Innes on view from April 7 – May 7, 2011. A preview will be held on Thursday, April 7th from 5:30 to 7:30 pm. Founded in 1991, Los Carpinteros, a collaborative comprised of two artists, Marco Castillo and Dagoberto Rodríguez, create sculpture, installations, and works on paper which merge elements of architecture and design. Included in the exhibition are watercolors and sculpture which take inspiration from the physical world. Los Carpinteros explore the mutable territory between the pragmatic and the imaginary, often including humorous and ironic subject matter. New York based artist James Casebere, also focuses on architecture and structure within a landscape by building complicated and detailed tabletop models which are photographed in his studio. Employing verisimilitude as one of his artistic tools, Casebere’s photographs often create a mood of emotional isolation. All of Casebere’s images are conspicuously absent of human form. However, one sees evidence of habitation in subtle ways: lights shining through windows, fires burning and garden hoses on lawns. By removing direct references to the human figure, Casebere creates an abstract narrative, allowing the viewers to place themselves within the image, in a sense completing the work. 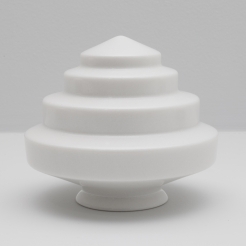 Brazilian artist Iran do Espírito Santo uses a minimalist approach to his sculpture and works on paper. He often uses materials such as glass, stainless steel, stone, or copper to give a tactile quality to his work while abstracting everyday items. Working with extreme precision and applying extraordinary technical rigor, the artist captures all details and is able to achieve perfection of each object’s form. His works reference design and functionality, as well as traditions within the Minimalist oeuvre. Callum Innes, a Scottish artist, uses a similar approach to achieving form through his paintings. Innes’s new works represent a significant departure from his iconic “Exposed Paintings” and are an exciting development in his continuing investigation into the making and unmaking of abstract painting. Innes still methodically prepares the paintings’ surfaces with size and gesso (as in the “Exposed Paintings”), yet in these new works, the picture plane is split vertically in half. Innes applies two separate colors across the entire surface and then rigorously removes the paint on one side. This process is repeated, leaving one half of the painting covered in layered, complex color whilst the other half of the painting is cleansed as much as possible back to the original gesso. Inevitably, the cleaned half retains a trace of the colors that were already absorbed. Each finished painting thus suggests a freezing in time of the otherwise momentary arrest of an ongoing process.